This advice from the ILCA. The following class rule changes will be effective from 1st January 2018. See the electronic compasses that have been approved for use after 1 January 2018. A fine but chilly day with a gusty 8 to 12 knot southerly greeted the Masters for the 20th running of the North Harbour Masters at Lake Pupuke. PRO Garth Briden was able to set a windward leeward course with just a very short offset reach at the top and the start finish line off the carpark. The course remained unchanged for the days 5 races. While this may imply that the breeze remained steady this was far from the case, with many large shifts and pressure lines offering plenty of opportunities up and down wind to those able to figure it out and leading to some dramatic place changes in many races. Consistency, as is so often the case, was the key and those able to limit their day to at most a single discarded disaster were in the end at the top of the pile. Local knowledge seemed to help some, although Phil Wild (A) from Manly was an exception to this, winning the Radials overall after overcoming Pete Thomas (GM) who had led after 3 races at the lunch break. Pete ended up third with Georgi Yankov (M) snatching second on a tie break. Both ended with identical scores, placings and discard with the tie only being broken on who beat who in the last race. Hamilton visitors Werner Hennig (GM) and Scott McDougall (GM) rounded out the top 5. In the Standards Tony Nicholson (M) sailed super well all day, recovering from a couple of tricky mid race positions to count 2 bullets a 2nd and a 4th to win overall from Masters Rohan Lord in second and Dean Drummond third. The chasing pack of GM's was eventually led by John Showell, who took 4th overall after creating a mission for himself by getting an OCS in race 1. Gary Lock was 5th, convincingly winning race 4 after finding the shift of the day on the right hand side of the beat. GM Chris Brodie was 6th and Club stalwart (and secretary) Dave Lowe raised himself above the chasing pack with a well executed win in the last race, which he will no doubt use as justification to delay getting a new boat for at least another 25 years! The prize giving under the control of Commodore John Dowsett was as usual a highlight of the day. The next major regatta for many in the fleet will be the North Islands in Napier, which is sure to offer different conditions and a whole new set of challenges. 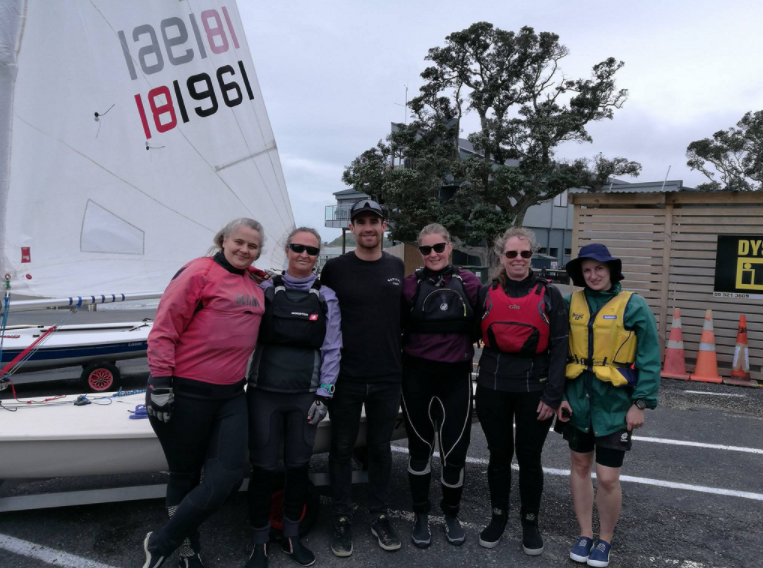 Five lucky ladies from Point Chevalier, Maraetai and Panmure took the opportunity last Saturday to be coached by Sam Meech, who just hopped off the plane from his World Cup regatta win in Gamagori, Japan. Like dried out sponges, we soaked up his advice and wisdom on rigging, sail trimming for the different points of sail. He provided personal tips for all of us to improve our sailing techniques which we are all now looking forward to employing on the race course. The coaching session was hosted at Maraetai Sailing Club, who welcomed us with open arms. Following a good work-out on the water, Sean, the Commodore and Sue Whitiskie provided us all with some muffins and a hot cup of tea. We have to thank Sam Meech for his patience and invaluable tips to sail fast, the Laser Association for sponsoring the training session and Maraetai Yachting Club for supporting the promotion of Women Laser sailing. See Chantal's Laser Women's write-up on flashissue.com. The Queensland Laser Association in conjunction with Australian Sailing is running two Coaching Clinics with Brett Beyer in the lead up to the Australian National Masters at Mooloolaba. The two camps will run from the 3rd to the 4th of February 2018, and from 6th to the 7th of February 2018 and will be held offshore at Mooloolaba. Sam Meech narrowly beat Tom Saunders by just 2 points after the medal race for 3rd place at the world champs test event in Aaarhus, Denmark. Sam has his worst day on the first day - before regaining his composure to catch up over the rest of the regatta. "We have organised Brett Beyer to hold a Laser Master Class coaching clinic for two days at Mooloolaba on Tuesday 6th and Wednesday 7th immediately before the Masters. Cost will be $250. 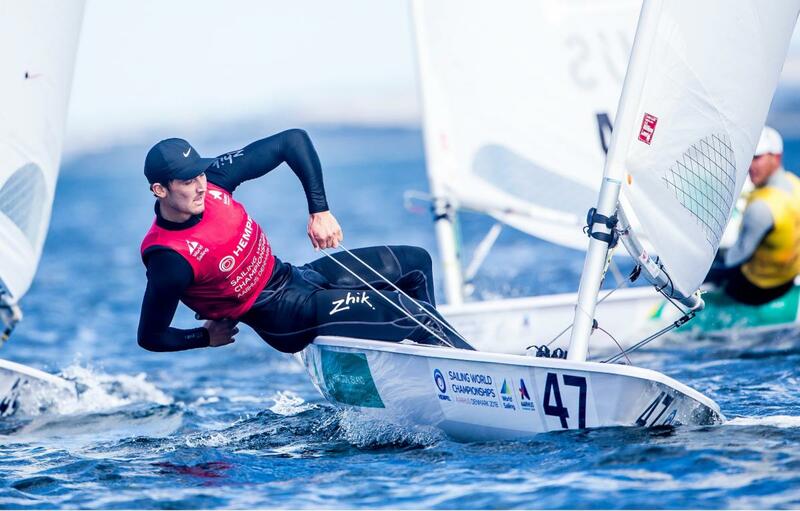 Max 10 entries - if more we will get Mitch Kennedy from the Australian Laser Sailing Team as an assistant coach and then expand to max 20." If you are interested contact Queensland chairman Michael Wilson, Michael Wilson <wilsomichael58@gmail.com>, 0417 758 859. They have confirmed that Kiwis are very welcome and they won't even include too many false tips!